Redemption’s Blade: After the War is a fantasy novel by Adrian Tchaikovsky. It’s also a novel about consequences. About the stark human costs of conflict, and of choices made by those on all sides of that conflict. It’s a story where the great battle of an age has bee fought and won, the bodies of heroes left discarded in the fields. The great enemy is defeated, but smaller ones remain. It’s a story about how we’re shaped by war, or perhaps let it shape us. Even a victory has costs, and restitution. Don’t get me wrong. In between the larger themes, there’s a lot of other cool stuff in here. A sword which can cut through anything. Moral dilemma’s. Demi-gods striding the earth. Duels that carry the clash of steel, and a narrative which makes that steel sing. But this is a book about people, about attitude and, yes, about consequences. Our view into this world is that of Celestaine. Celestaine is a Hero, at least as far as the world is concerned. She killed a dragon. She helped kill the archenemy who would throw the world under his twisted, raging boot. Some time later, Celestaine is asking questions. Not about whether removing the enemy was the right thing to do, but the follow-up. The land is shattered by war; many of the old social cohesions have broken down. The armies of the Dark Lord are broken and contained, but still around, and nobody seems quite sure what to do about them. There’s a tide of populism and intolerance, as religions of the vanished gods try and keep control, struggling to justify their existence in the absence of the objects of their faith. If the war was an epic struggle filled with great martial deeds, this is a land in need of something quieter, a heroism which heals. Celestaine is making an effort to be that hero. Ridden by survivor’s guilt, she’s looking for a purpose, a way to help fix a land which she takes some blame for having broken. For all of the lost friends and lost potential, and the dream of a land which once was – for all of those things and more, Celestaine takes the blame. That said, if she’s emotionally damaged, wrung out and exhausted by the reconstruction reality after the glory has passed, she’s still kicking serious arse. With a sword that cuts through anything and a low tolerance for other people’s crap, she’s a force to be reckoned with. Celestaine is a real pleasure to read, because with all of her baggage, she doesn’t consider herself a hero – but striving alongside that baggage, doing the right thing in spite of it, putting in an effort to make things right, to earn her own survival – it gives her the potential to do heroic things, for the right reasons. Suffering from combat fatigue and stress, alongside her emotional trauma, sometimes Celestaine is a tough read – but she feels like a person. One that has seen and done some pretty terrible things, now trying to keep on doing the right thing. There are others of course – from cowardly godlings to comically scheming collectors of arcane artifacts. From ex-servants of a great enemy, now making their own way in the world, to old companions(and old enemies) gone astray. I hold a special place in my heart for theex-soldiersof the enemy. Discriminated against and eyed with something between hostility and suspicion by the populace, they’re setting out to make their dreams real, and perhaps to integrate further into the larger world. Its in their nature to fight, and they’re determined to build instead. That they’re charming, funny, and can pick up a person and club them with nearby scenery are all added benefits. I guess what I’m saying is, the characterisation is top notch. Each character brings their own unique perspective to the whole, and they also carry emotional weight – of survival, of slavery, of performing atrocities, or being victims of one. Some of the villains, as it were, are sympathetic, their actions driven by what they think of as necessity, heroes in their own story. Others are just out and out nasty, which makes their appearance on the page a shudderingly terrible delight. The plot? Well, it’s a quest, of sorts. In one way, it’s a simple thing, finding a magical artefact, a Macguffin to right wrongs. But in another, it’s a personal journey – for Celestaine, as well as her friends and enemies. Moving from place to place they see the consequences and costs of conflict, and learn about themselves along with the world. This is an incredibly thoughtful work, beneath the swords, questing and heroism. It looks beneath those things, at the price, at the human cost, at the sleepless nights, at the efforts to re-raise a razed village, or to maintain faith in a world now inimical to it. That said, there’s also a lot of absolutely pitch perfect dialogue, some properly explosive magic, and even the odd sword fight. 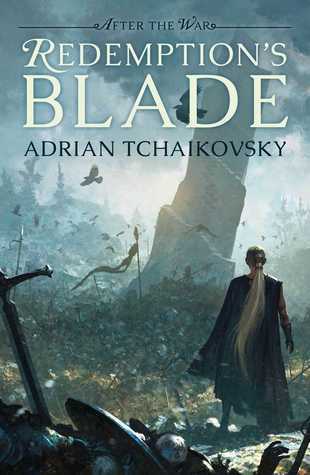 There’s blades, magic and quips in plenty, and those will keep you turning pages – but the deeper themes, of struggle, loss, survival, rebuilding and, yes, redemption, will mean you can’t put the book down until the very end. It’s hard, it’s emotional. It’s funny and grand and rather human – and all of that makes it a brilliant book, which I recommend without hesitation.